Rhino Ridge Safari Lodge, part of the Isibindi Group of Lodges is the first private safari lodge to be situated within the Hluhluwe iMfolozi Game Reserve, a low risk malaria area. The reserve is one of Africa’s oldest game reserves and not only home to Africa’s ‘Big 5’ but also world renowned for their successful efforts in rhino conservation. Rhino Ridge Safari Lodge is ideally situated on the western boundary of the Hluhluwe-iMfolozi Park, which is well placed off the main N2 route between Durban and Swaziland and accessible by normal 2 x 4 vehicle. Travelling time is approximately a 3 hour drive from Durban (270km), just under 2 hours from Richards Bay (about 100kms) and about 7 hours from Johannesburg (580kms). There are daily flights from Johannesburg to Durban and Richards Bay airports from where guests can arrange a hire car or a road transfer. Rhino Ridge Safari Lodge is the first private concession within Africa’s oldest proclaimed Game Reserve and comprises 22 rooms, nestled in natural bush high up on the ridge offering commanding views of the Reserve. The lodge has 2 Honeymoon Villas, 8 Luxury Bush Villas and 4 Safari Rooms. 2 Safari Family suites have 2 rooms which share a common lobby, but which may be separately secured or serve as an inter-leading 2 bedroom family unit. Each Suite and Villa has an en-suite bedroom with Twin or King Size beds, indoor and outdoor showers and a separate toilet. The rooms further boast private, wooden viewing decks, offering panoramic views. Part owned by the local Mpembeni Community, Rhino Ridge Lodge is a ground breaking initiative – being the first private facility within Hluhluwe iMfolozi - Africa’s oldest proclaimed reserve. The Hluhluwe iMfolozi Game Reserve is 96 000 hectares in size and is world renowned for its very successful efforts in Rhino Conservation – brought about through ‘Operation Rhino” in the 1950’s and 60’s. The park now has the largest population of white rhino in the world. Also famed for its wilderness hiking trails and Game Capture unit - the reserve has an immensely diverse concentration of wildlife and offers excellent birding opportunities, with over 400 different recorded species. Rhino Ridge offers twice daily game drives in the early morning and evening with experienced, knowledgeable and professional rangers - in specially adapted open Land cruisers. 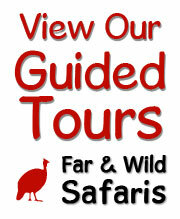 Guided Bush walks are offered daily. In addition to the private concession area, guests also have unlimited access to the greater Hluhluwe iMfolozi Park, which is home to amongst others, Africa’s ‘Big 5’ – lion, leopard, elephant, buffalo and rhino. All Rhino Ridge guides and rangers hold the highest guiding qualifications to ensure that guests get the most exciting, safe and informative encounters, with the African bush - during their stay at the Lodge. The Lodge boasts beautiful Spa facilities which have been designed to ensure that guests can soak in the sights and sounds of Africa, while enjoying a full range of beauty therapies by a team of dedicated professionals. Rejuvenate the mind, body and soul while relaxing in tranquil surroundings with spectacular views over the park. Access to the Rhino Ridge Safari Lodge, has to be within the reserve’s opening and closing times. Hluhluwe-iMfolozi Park has 3 entrance gates – Memorial Gate to the north (approximately a 20 minute drive to the lodge), Nyalazi in the East (approximately a 30 minute drive to the lodge) and Cengeni in the south (approximately a 90 minute drive to the lodge). The gates open at 06h00 or 07h00 and close at 18h00 or 19h00 in summer and winter respectively and guests must arrive within the above time frames, as after this - access to the park will not be allowed and visitors will have to overnight outside the park. Rhino Ridge Safari Lodge offers 4 star luxury, spectacular scenery and excellent safari opportunities in the heart of Big 5 territory and is the only private lodge within the Hluhluwe-iMfolozi Park, a low risk malaria area. The lodge is ideal for conservationists, wildlife enthusiasts and tourists. The information on this website is correct - to the best of our knowledge - as of May 2015. Subject to change without notice or correction.